from the 1920’s (Click to enlarge). REIDsteel was established by Colonel John Reid in 1919 and in the 1920s we started making the first bespoke aircraft hangars. It all started with an order form the French aviator, Louis Blériot who was initially storing his plane in a cattle shed much to the disappointment of the local farmer! 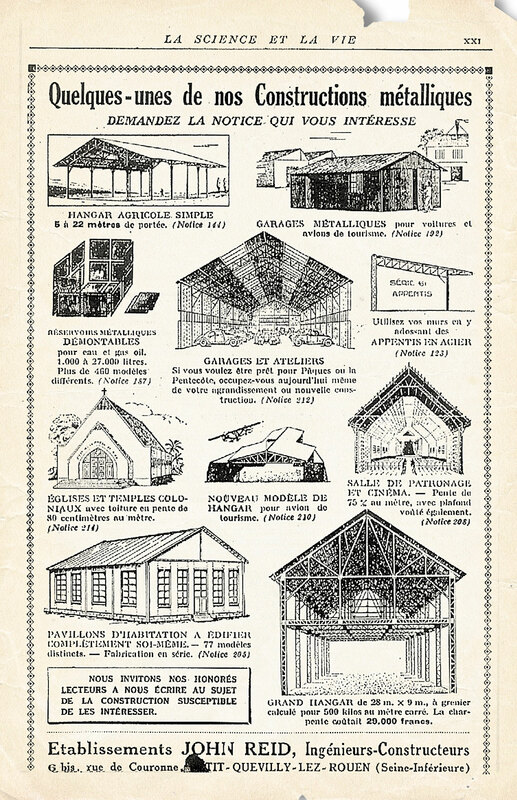 The tailored solution that REIDsteel designed for protecting his planes was described as an aircraft hangar, as the word ‘hangar’ comes from the Middle French word ‘hanghart’, meaning shed. Despite the name, it was obviously a much better place to keep a plane than with the disgruntled cows. Today our customers include major airlines, aircraft maintenance companies, small airfields and individual customers with private jets in countries all over the world. We know that the most valuable assets to you are budget and time. All our clients can remain confident that their investment will be looked after, delivered to site and erected on time and importantly on budget. We are able to do this due to our financial integrity and our complete building envelope service. While we offer a wealth of experience and competence in the design, fabrication and erection of steel framed structures and cladding systems, we continue to innovate and push ourselves; technically and in different markets. It is no wonder we have become an internationally recognised and very successful British registered steelwork company. From our base in Southern England, we export to over 140 countries across all five continents. We specialise in designing for the impact of extreme weather such as earthquakes, hurricanes, tornadoes and tsunamis. Our buildings are renowned for being some of the safest structures in some of the world’s most dangerous places including war zones and areas with limited infrastructure. This expertise earned us recognition in the form of four Queen’s Award’s for Enterprise (international Trade). As well as aircraft hangars and their doors, we design and build a wide variety of steel structures, from industrial and commercial buildings, to bridges, grandstands, car parks, churches and safety barriers.